Prosthetic devices for humans are easy enough to obtain, and they’re getting more advanced every year. But animal prostheses are a little harder to find, so creative vets often find themselves making up their own solution for injured animals. 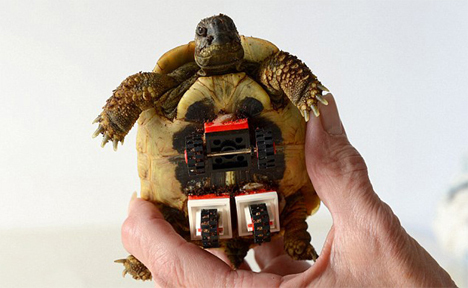 Dr. Plischke fitted Blade with two sets of Lego wheels on the underside of his shell. The wheels lift Blade off of the ground just enough that he can move his legs to scoot himself around. 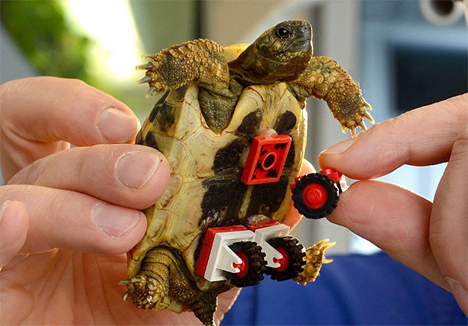 This isn’t the first time Lego wheels have been used to give shelled friends a mobility boost; another German vet used a similar technique on a turtle missing a leg. 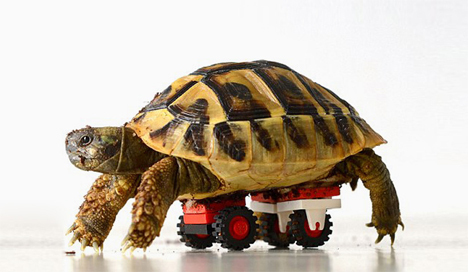 The makeshift Lego wheelchair is only a temporary measure; the vet says that Blade will eventually regain full use of his legs and be able to walk like any other tortoise. Until then, he gets to ride around on one of the sweetest animal mobility scooters ever built. See more in Cybernetics or under Technology. December, 2014.